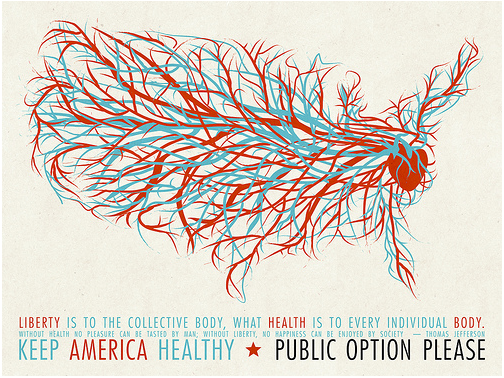 Public Option Please, a lefty advocacy group, set out to find a poster artist who could dramatize their argument for government-funded health care. Judges (including Arianna Huffington and Jesse Dylan) found not just a poster artist but a poster girl for their cause. Their winner, Amy Martin of Los Angeles, created her striking image of red and blue blood vessels coursing through a map of the United States when she was home sick with the flu, and a few weeks later, organizers said, lost her job and health insurance. “A healthy United States is dependent on healthy American citizens — which is why I presented America as a vulnerable living system.” She’ll spend her $1,000 winnings on insurance premiums, they said. Continue reading at Public Option Please . . . This entry was posted on Wednesday, December 9th, 2009 at 7:00 am	and is filed under art, General, Mapping, Print, Promote. You can follow any responses to this entry through the RSS 2.0 feed. Both comments and pings are currently closed.